• Tech Tip: Centering Position Sensors and more. To view newsletter in your browser click here. You’ve likely seen military-type exoskeleton bodysuits in dramatic movies improving the wearer's strength and other attributes, now real technology has been developed to help people with strokes and spinal-cord injuries. Someday soon they may be able to leave their wheel chairs behind. Now Ekso Bionics has received FDA clearance for their Ekso Bionics Exo GT robotic exoskeleton. It provides 0 to 100% variable power dynamically to either side of a wearer's body to enhance strength and optimize the person’s gait. See the video of the suit in action. Mechanically speaking there are two types of rotary angle sensors ones with or without a shaft. Each type has its own benefits from proper centering and its own methods for centering. For shaft-type sensors, the benefits gained from centering include low friction torque applied from the drive shaft, lower loads on the bearing system and lower loads on the shaft all help ensure specified measurement precision is achieved no matter the brand of sensor used. To center these sensors you need to use the design features of the sensor. These include a reference point using the outer circumference of the sensor housing, boss on bushing mount (e.g. Novotechnik PD300 Series), precise bearing diameter feature ( e.g. 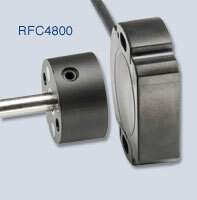 RSC2800 Series) and servo size/outer diameter as fixed measurement dimensions (e.g. P4500 Series). One other consideration for shaft-type sensors is if the shaft has play in it, you may want to use a flexible coupling that covers the eccentricity and preferably one that is play-free for your application. 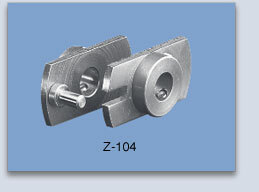 A second possibility is to use a low backlash fork-pin coupling as shown in the photo above. If your application has problems applying a shaft-type angle sensor, consider a touchless angle sensor. Touchless angle sensors also need to be centered to avoid degrading the specified precision of the sensor. With touchless technology an eccentricity-driven linearity error is added if the magnetic marker attached to your application is offset too far from the center of the associated measuring sensor. Also the magnetic field will be too weak if the distance from the sensor to the magnetic marker is too great. Radial misalignment can result in independent linearity error of 0.3 to over 1.5% for a misalignment of about 1 to 3 mm- depending on specific sensor and magnet used. Again, to align the magnet with the sensor, use the sensor's design features. These include: outer circumference of the sensor, locator holes in the sensor for pins (e.g. RFC 4800) and servo diameter of the sensor (e.g. Vert-X 13E). For applications that permit less precision, mounting holes can be used (e.g. RFD 4000, RFC 4800). Centering helps ensure low eccentricity between magnet and sensor. However, if there is eccentricity that cannot be avoided in your application, use of a bigger magnet will reduce linearity errors. If you have questions about centering angle sensors or other position sensor questions related to an application, contact Novotechnik’s friendly technical specialists. They’re here to help. 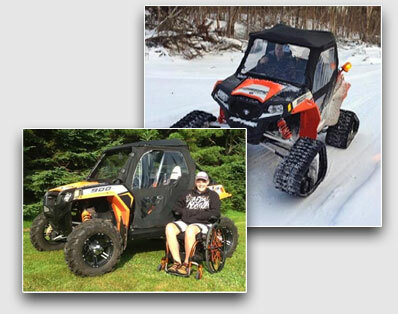 A custom aftermarket all-terrain-vehicle manufacturer needed a reliable and accurate position sensor they could use for all position-related controls to allow their vehicles’ steering, brakes, throttle, gearshift and other motion accessories to be controlled via a joystick for disabled persons, while a non-disabled person is seated next to the disabled driver ready to switch to stock controls and take over, if needed. Vehicles are customized using a closed loop feedback control system consisting of user input through a joystick and switches. An onboard computer system, called DAAC for Design Ability Access Controller, reads a user input sensor, usually a joystick, as well as vehicle feedback sensors for wheel position, etc, and adjusts the vehicle components being controlled so that output and input values reach the same value. In cases where it is required, linearization and scaling are applied to match the range and rate of change between input and vehicle feedback sensors. Novotechnik’s TX2 met their requirements and was easily incorporated into each of their different vehicles' position control applications. If If you have a question about position sensors for your specific application, Novotechnik engineers would be glad to speak with you. Contact us at Email Novotechnik info@novotechnik.com or call 800-667-7492.